Every month has a map of the night sky and notes on seeing the planets, eclipses, etc. There are festivals and secular holidays from all round the world, and a moon phase for every night. Full of information and inspiration. Last calendar illustrated by the wonderful Maggie Organ. Runs from 8 December 2018 to 26 December 2019. Printed on FSC grade paper from sustainable sources, using vegetable oil based inks. Fully recyclable and biodegradable. British/Irish clock times. now £8.50 with £1.50 delivery charge per order to UK addresses. Elsewhere in Europe it’s £3 per order, plus £1 per calendar; elsewhere in the world it’s £4 per order, plus £2 per calendar. Excellent companion to the calendar, with new, clear design. 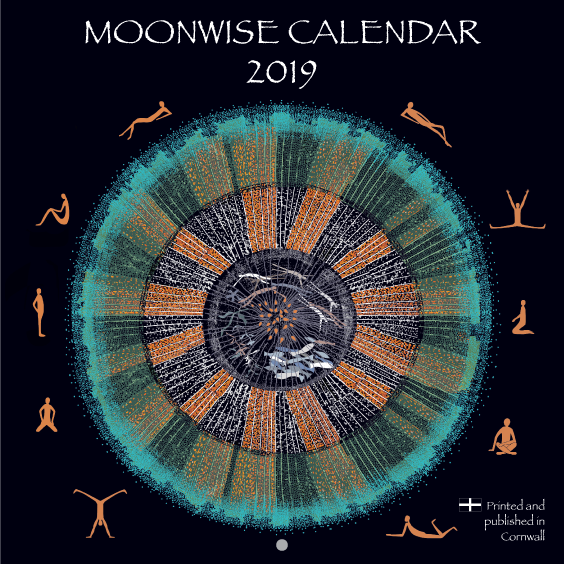 A5 and easy to use, with a spread for each week, and plenty of space to write; daily astrological information and moon phases; rising and setting times of sun and moon for London, Cardiff, Manchester, Dublin, Glasgow and Inverness; year-to-view of 2019 and 2020; useful glossary of all the special days. 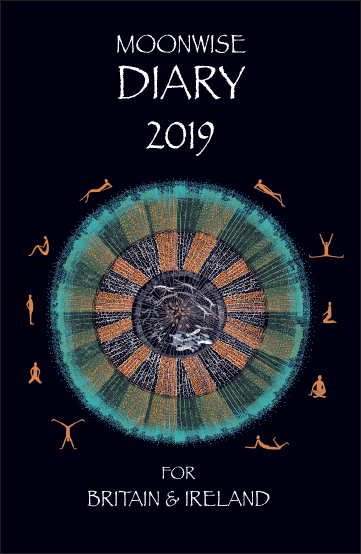 Runs from 8 December 2018 to 5 January 2020. Blank pages at the back for your own notes and addresses. Printed on acid free paper, using the print-on-demand method, in order to save waste. £11.25 with £1.50 delivery charge per order to UK addresses. Elsewhere in Europe it’s £3 per order, plus £1 per diary (first diary not counted); elsewhere in the world it’s £4 per order, plus £2 per diary (first diary not counted). Check out the order form for available discounts. Bilingual edition for Cornwall. Cornish festivals alongside all the usual worldwide ones. Rising and setting times for Penzance, Truro, Bodmin, Bude, Saltash and Hugh Town. Easy to use, whether or not you know any Cornish. 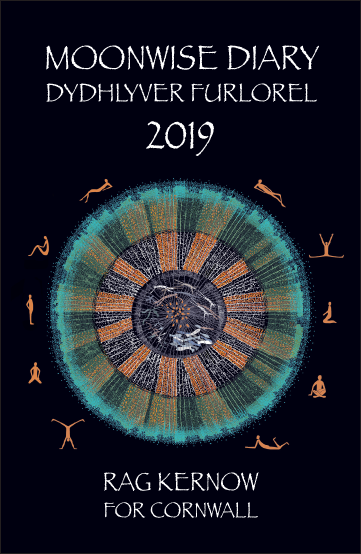 Runs from 8 December 2018 to 5 January 2020. Apart from ordering online, you can order by telephone with Visa, Mastercard or Maestro by ringing 020 8133 1451 from the UK, or +44 20 8133 1451 from elsewhere. You can also order by post with a UK postal order, or by a cheque in sterling or euros drawn on a bank with a UK address. Payable to Edge of Time Ltd. Send to: Edge of Time, BCM Edge, London WC1N 3XX. If you are in the eurozone, and wish to pay in euros with a cheque, please contact us as a banking charge may apply. It is much simpler and cheaper if you have access to Visa or Mastercard (and you can order online). We normally reckon to dispatch calendars and diaries within about three working days, if not the same day. Other services are likely to take longer. To save costs, we use second class post where possible within the UK. For the rest of the world, we always use air-mail. If you use post to order from us, please be aware that it will be re-directed on to us from the London forwarding address, and will take a day or two longer than usual to reach us. 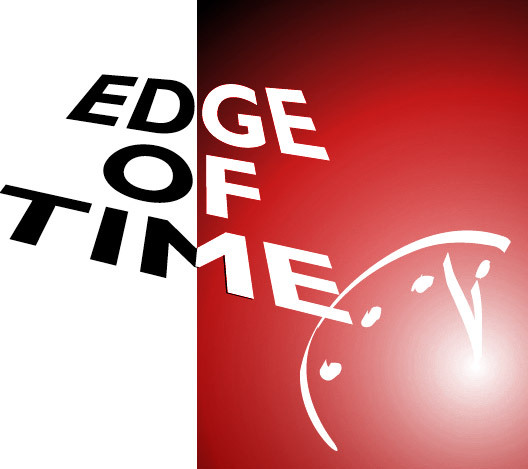 Edge of Time is a co-operative of small publishers in the field of cultural change.